We get a lot of questions about hot pistol models. We thought it would be fun to put together a list of our 5 Most Popular Airsoft Pistols. Now this countdown isn’t a list for the best performing pistols by any means. This is simply the most in demand Pistols that people have asked us for. The ASG CZ P-09 came out back in 2015 and took the market by storm. It boasts a comfortable grip, good stock performance, and it can use green gas or CO2! The design of the CZ grip was made to be as comfortable as possible. People with small hands still find it comfortable, even with a double-stack magazine. Performance wise, the P-09 can go toe to toe with most stock pistols available. Range, accuracy, consistency, and gas efficiency are all amazing in it’s price range. The most appealing option that this pistol has, is its ability to use green gas or CO2. With green gas the P-09 works great for indoor fields. With CO2 it works perfect for outdoor play. A lot of people come into Airsoft with some kind of gaming experience. A lot of games feature real guns and most of them have an Airosft counterpart. One of the most common guns in the gaming world is the M9 pistol. Used in everything from Doom, Call of Duty, Battlefield, Arma, and so many more. Many of us have used an M9 in the virtual world. 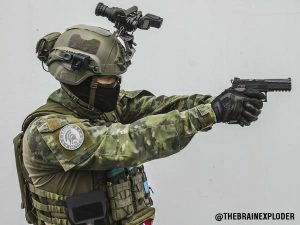 A lot of times we transition to an M9 in Airsoft. We didn’t list a specific brand M9. There are so many different brands to choose from and each has its pros and cons. Personally, I prefer the KWA M9 due to it’s good performance out of the box. If you’re on a budget, the Elite Force or KJW are also great options. The Hi Capa is the go to standard for Indoor Airsofters all over the world. The Hi Capa has a seemingly endless supply of upgrades. 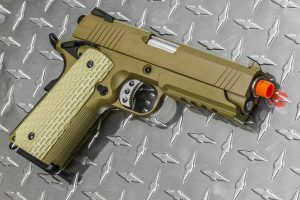 The Hi Capa platform is a model that should never go out of service. A base gun can start at $100 and be the final investment for an indoor gun. There are also guns that perform great out of the box. The AW Hi Capa Line is one of the hottest Hi Capas on the market. Builds can cost thousands, depending on what parts go into it. There’s a reason the Hi Capa is a go to in the indoor world. It’s light, upgradeable, and consistent. What more could you ask for from a sidearm? The 1911 is debatably the most iconic pistol ever made. In the real firearms world it has been used since its creation in 1911. To this day, it’s still used by Special Forces groups and Law Enforcement. A lot of people say the 1911 is an outdated system. Regardless, any weapon system with a continuous service life of 107 years is impressive. 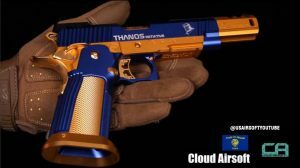 Everyone from real steel shooters to gamers knows what a 1911 is. There are very few pistol manufacturers that don’t make a GBB pistol version. Elite Force, WE, KJW, KWA, just to name a few. Just like the Hi Capa, upgrades are endless to make it perform amazingly. e life of any military weapon in history. The Glock is quickly stealing the spotlight in the Law Enforcement and Military world. 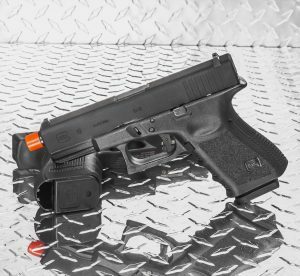 Using a highly reliable striker fire system, the Glock was designed to do one thing, work. In airsoft, that is no different. There are several companies who have produced Glocks over the years. Only recently has Elite Force secured the licensing. Now that Glocks can be sourced reliably, their appearances will become much more widespread. Companies such as PTS and Maple Leaf have already started making upgrade parts for the new models. It may only be a matter of time before they take over the Airsoft market. Just how they took over the real firearms market. 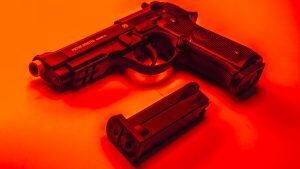 Is it safe to shoot Airsoft Guns at Each Other?